Metal fabricators and manufacturersare faced with many challenges. Supplier changes, changes in metal prices, changes in customer needs or specifications, and changes in regulations that affect how alloys must be manufactured-such as Pb-free regulations-are ever-present and require the ability to respond and adjust quickly. While some of these changes come with ample warning, others are sudden and require tools to immediately make assessments of the composition of incoming metals, in-process components, and outgoing final products. Contact us now for information on the Bruker S1 TITAN; the best tool for the job! comply with regulations restricting the use of certain toxic metals such as Pb (lead), Cd (cadmium), etc. Alloy QA/QC is essential to any metal fabrication business, because an out-of-specification alloy-or simply the wrong alloy altogether-can result in disastrous part failures that can lead to loss or breakdown of your customers’ expensive equipment, bad press, and sometimes even loss of life. Because alloy QA/QC is essential to the health of your business, you need the best possible tools to meet these challenges, reduce your liability, and maintain a solid reputation. 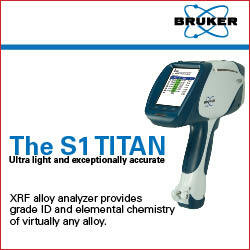 The Bruker S1 TITAN, the state-of-the-art in handheld metal composition analysis technology, is the premier tool. 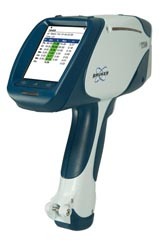 The Bruker S1 TITAN is a handheld XRF (x-ray fluorescence) instrument that provides the user with the elemental composition of a metal or alloy in a matter of seconds. Furthermore, the S1 TITAN’s advanced alloy library capabilityverifies the grade of any alloy almost instantly, so even the novice user can immediately tell whether an alloy isin spec. Contact Bruker today for a free demonstration of the S1 TITAN at your worksite or a price quote.